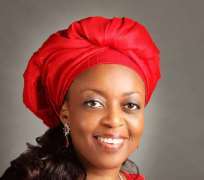 The acting Chairman of the Economic and Financial Crimes Commission (EFCC), Mr. Ibrahim Magu, says the commission is seeking the extradition of former Minister of Petroleum Resources, Diezani Alison-Madueke because the United Kingdom authorities have failed to take legal action against her despite being there since 2015. Magu said this while briefing journalists on the activities of the EFCC in Abuja on Monday. He declared that the commission was equipped to successfully prosecute the former minister who has been accused of mismanaging oil funds to the tune of $20bn. When asked if her extradition to Nigeria would not affect her pending case in the UK, Magu said, “There is no court trial. She was being investigated even before I assumed office. So, it has taken so long and it is very unreasonable that she is not being tried there. “So, we are tired of waiting and that was why I said if you cannot prosecute her, bring her and we will prosecute her. There is no prosecution going on in the UK. “We are involved in the investigation in this country and outside the country including America and London. I have been there. We have worked and sat together.